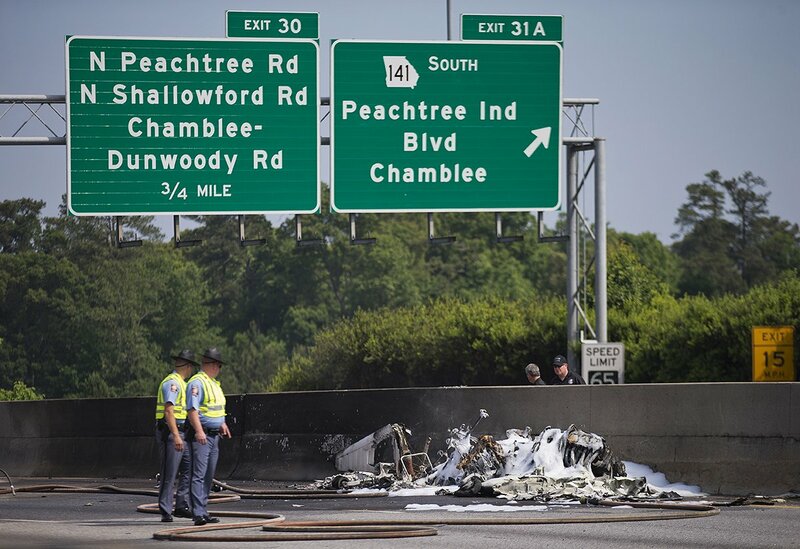 A single engine plane has crashed onto a metro Atlanta interstate shortly after takeoff, killing all four people onboard. The aircraft burst into flames, but none on the ground was hurt although the plane nearly stuck a vehicle. “It’s a miracle, literally a miracle, that no other cars were hit,” DeKalb Fire Capt Eric Jackson said. The Piper PA-32 crashed minutes after taking off from DeKalb Peachtree Airport on May 8. Rescue workers shut down Interstate 285 in both directions so investigators could determine what happened. The closure created traffic problems through the city. The plane officially took off at 9:59 a.m. and was scheduled to land just before 11 a.m. CT in Oxford, Miss., according to FlightAware, flight-tracking service. It arrived around 9:15 a.m. from Asheville, N.C., where the plane apparently was based. The plane was clearly in distress, said witnesses, many who slammed on their brakes to avoid what was developing. All lanes in both directions of I-285 are blocked at the scene, and Georgia Department of Transportation officials say the interstate will be closed for at least eight hours and are telling all travelers to take alternate routes and avoid the area for the rest of the day.